Getting to the C-suite has changed with the times. So, what does it take to make it there today? In my executive coaching experiences, whether Fortune 100 or Fortune 1000, I have seen an important trend emerge – the power that comes from clarifying and communicating your purpose. In business today, there is an increasing emphasis on defining and communicating your personal brand. When we think about brand, the process often starts with a question about what we want to be known for; what do you want people saying about you when you are not in the room? A successful personal brand communicates a clear, consistent message about who you are and what you offer. In working with hundreds of executives over many years, I have found that brand is an extension of purpose. Therefore, the ability to clarify our purpose and live into it courageously influences our individual, team, and organizational effectiveness and impact. Clarifying purpose begins with the fundamental question of “why.” Why do you do what you do? Those who are the most effective in getting to and experiencing success in the C-suite are clear about their purpose. Most importantly, it is a purpose anchored in service beyond themselves. How do you want to be of service as a leader? What contributions do you want to make? What legacy do you want to leave? 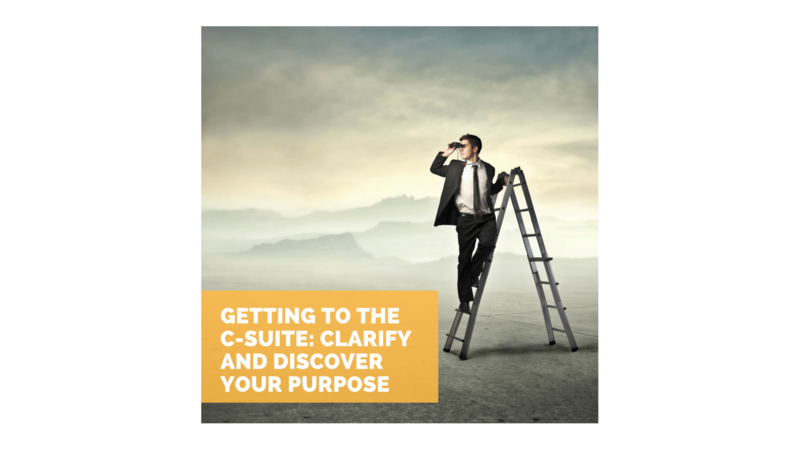 Individuals connected to purpose experience high levels of engagement, contribution, and fulfillment, yet questions about purpose are some of the most challenging for people to answer. The temptation is to answer such questions about your role with a statement about what you do versus why you do it. Purpose emanates from your core and describes who you are versus the role you play. It is your call to action. For example, my role is that of an executive coach and leadership development strategist. I do what I do because supporting people in awakening to and achieving their greatest potential is the work that is most meaningful for me and that allows me to make the greatest contribution. How your passions and values align with the purpose of the organization you wish to lead. The feedback you have sought and received to determine how you are showing up to others. This reflection is powerful. Through reflection, it will become increasingly clear how your participation at the C-suite level can best support not only your personal brand or your purpose, but also your organization’s purpose and your significance and impact there as a leader.